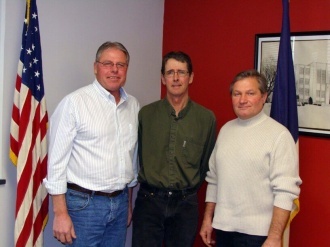 The Allamakee County Board of Supervisors is a three-member board. In Allamakee County the Supervisors are elected at large. The Board of Supervisors meets every Monday starting at 9:30AM with 10 minutes for public comment followed by the agenda, and the meeting lasts until all business is done. Also the board meets as needed for special circumstances. The agenda is posted at the Courthouse by Friday at 9:30 am and also on the Allamakee County Web page. To get on the Supervisors Agenda, you need to contact the Auditors Office by 3:00 PM Thursday, before the Monday meeting. Besides having a scheduled Monday meeting, each Supervisor sits on other Boards throughout the County, area Counties, and State. Each takes an active part for promoting and protecting the citizens of the county. SEE LIST OF COMMITTEE ASSIGNMENTS ABOVE. • Adopting a county budget. This is done every January with each department head having input. • Responsible for the construction and maintenance of the county’s road/bridge system. • Levies taxes to raise revenues for county purposes. • Attending meetings for county representation.